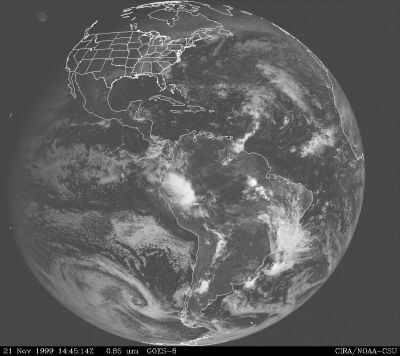 The National Oceanic and Atmospheric Administration (NOAA) has several Geosynchronous Orbiting Environmental Satellites (GOES) in orbit watching the Earth's weather and environment. On November 21, 1999, at 14:45Z hours our satellites caught an amazing photo of a UFO at an estimated hundred miles above the Earth off the coast of the state of Washington. The University of Colorado also keeps these photos on file for reference. 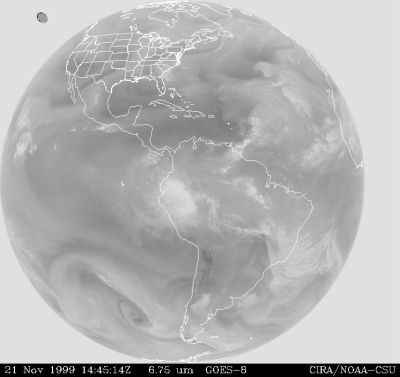 One of the satellites is designed to pick up water vapor or clouds from space. When Russel Kirchner caught sight of the UFO in the display he zoomed in and could see the steam coming off a UFO. It was of the type identified as a large Mother Ship. The possibility of the object image being caused by a computer error was discussed and ruled out. 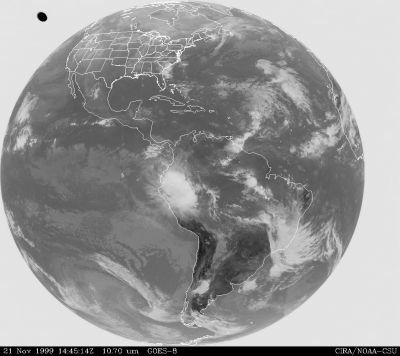 Similar photos taken on June 8, 1995, over South America have also been widely distributed. Philip Imbrogno studied this case and NOAA explained the image was a "moon shadow UFO."